Love is in the air! 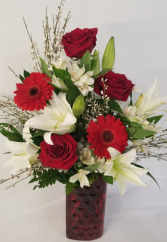 Show it with this beautiful arrangement of premium red roses, white oriental lilies, white alstroemeria and babies breath. It is in a red crackled vase and accented with a glittery heart pick. 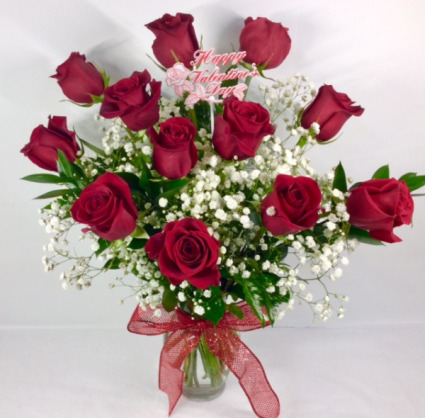 Impress your loved one with this beauty! 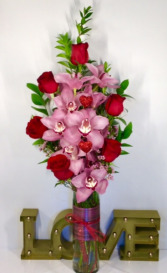 This arrangement is in a red glass vase with embossed hearts. 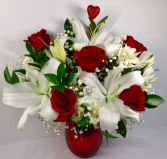 It is filled with the best smelling flowers, like lilies, roses, genestra, gerbera daisies and alstroemeria.